The Senate President, Bukola Saraki, his deputy, Ike Ekweremadu and former clerk to the National Assembly, Salisu Maikasua, were docked at the the Federal High Court Abuja this morning for alleged forgery of senate orders. They are facing a two-count-charge bordering on conspiracy and forgery of senate rule in 2015. They all pleaded not guilty when the charges were read out. Shortly after the defendants entered their plea to the charge marked CR/219/16, the Director of Public Prosecution, DPP, Mr. Mohammed Diri, notified the court of FG’s counter-affidavit opposing release of the accused persons on bail. 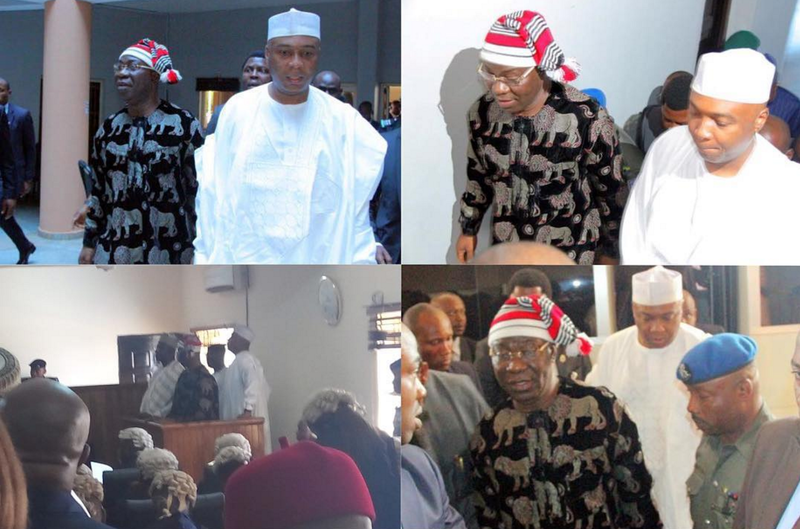 The court has also granted bail to Saraki, Ekweremadu and two other accused persons — Salisu Maikasuwa, former clerk of the national assembly, and Benedict Efeturi, deputy clerk of the legislature. The judge adjourned to July 11 for trial.